An amazing 5 day trek. Far cheaper than the Inca Trail and much more to see and experience ranging from hot springs to quaint traditional Peruvian villages and, for the adrenaline junkys, some zip lining 300m across the raging rivers below. We were a part of a 15 person group and had porters for each of us to help with the equipment and our belongings. Our guides were knowledgeable, friendly, and very patient with our group of 15. 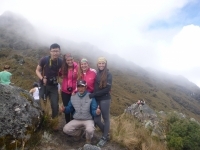 We had people of all experience levels and did not feel pressured to be quick or slow down during the trek. Una experiencia inolvidable ! Una aventura para recomendar y hacer con amigos. Es todo un desafío, por momentos difícil, pero todo vale la pena con solo proponerselo y cumplirlo ! Lugar maravilloso con paisajes impactantes, donde compartis distintas culturas, gente solidaria alentandote y ayudando en todo momento ! 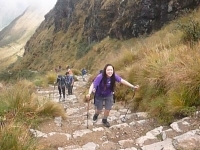 I went with the 4 day 3 night Inca Trail tour. The view on the road was absolutely amazing. This trail may be the most beautiful place I've ever been to. Our tour guide Marco was very funny and prepared thoroughly for presentation. 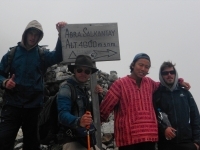 The cook prepared us delicious food and the porters carried our equipment all the way. Un viaje maravilloso, una experiencia inolvidable... hacia mucho tiempo que con mis amigas queríamos cumplir el sueño de hacer este viaje y se concretó ! La verdad la pasamos genial y con la gente que nos toco vivirlo mucho mejor. El servicio durante el camino fue excelente al igual que el guía que además fue muy divertido. Una experiencia única, fabulosa, difícil pero vale la pena. La vista todos los días nos despierta con un desafió distinto y fue mi deber levantarme y enfrentarlo. Que gratificante. Dichosa de poder vivirla. 4 días de pura vida natural. La comida, la gente. Momentos de esos que no sabes si puedes repetir y que jamas olvidare. 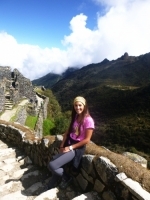 I did the four day, three night Inca Trail trek and I loved it ! This was my first time in the Andes and it was absolutely incredible. The vistas were breathtaking -- steep mountains that pierced the clouds, lush greenery, and historic ruins. When we came to Peru I expected to reconnect with old friends, but didn't know I'd make so many new ones ! 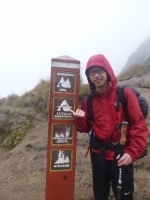 Our guides Edwin and Jimmy were extremely knowledgeable and friendly, and they managed a scattered group excellently. We got very lucky with gorgeous weather so we got to experience majestic views almost non stop ! Actually, I always knew, but I never hated it more than on this trip (pro tip: train for stairs, especially steep ones). 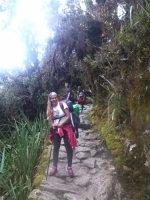 Although it was one of the hardest and longest treks I've ever done, it was so worth it in the end, especially with the help of our amazing guides Edwin and Jimmy and all the porters and cook. The hike was the most physically strenuous thing I have ever done in my life but also the most rewarding experience of my life. We came into Peru only seeing pictures of Machu Picchu. We also had no idea what we would see at the Inca Trail. We were absolutely blown away. 10 of us just finished an epic trip on the Inca Trail - it would have been infinitely harder if it weren't for the guides, staff and porters having our back along the way. Our group was a good mix of beginners and advanced and our group catered to everyone.